Honorary President of IDC M. Fethullah Gulen is a Turkish Muslim scholar, thinker and sufi who has inspired the Turkish community to get involved in especially educational and interfaith-intercultural activities, both of which are critical for a bright future and for peace on our earth. Below is his short biography. However, you may want to visit www.gulenmovment.us for more information or http://www.hizmetnews.com/ for up to date news. 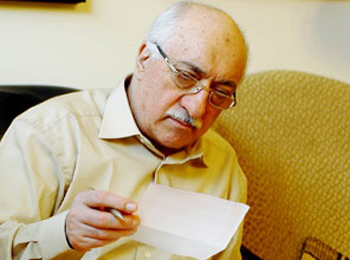 You should also visit sites like www.fgulen.com, http://www.fethullahgulenforum.org, Gulen Institute and The Journalists and Writers Foundation in Turkey. You will find more links at the this page. Born in Erzurum, in eastern Turkey, in 1941, M. Fethullah Gülen is an Islamic scholar and thinker, and a prolific writer and poet. He was trained in the religious sciences by several celebrated Muslim scholars and spiritual masters. Gülen also studied the principles and theories of modern social and physical sciences. Based on his exceptional skills in learning and focused self-study, he soon surpassed his peers. In 1958, after attaining excellent examination results, he was awarded a state preacher's license, and was quickly promoted to a post in Izmir, Turkey's third largest province. It was here that Gülen started to crystallize his theme and expand his audience base. In his sermons and speeches he emphasized the pressing social issues of the times: his particular aim was to urge the younger generation to harmonize intellectual enlightenment with wise spirituality and a caring, humane activism. Gülen did not restrict himself to teaching in the inner cities. He traveled around the provinces in Anatolia and lectured not only in mosques, but also at town meetings and corner coffee houses. This enabled him to reach a more representative cross-section of the population and to attract the attention of the academic community, especially the student body. The subject matter of his speeches, whether formal or informal, was not restricted explicitly to religious questions; he also talked about education, science, Darwinism, about the economy and social justice. It was the depth and quality of his speeches on such a wide range of topics that most impressed the academic community, and won their attention and respect. Gülen retired from formal teaching duties in 1981, having inspired a whole generation of young students. His efforts, dating from the 1960s, especially in educational reform, have made him one of the best-known and respected figures in Turkey. From 1988 to 1991 he gave a series of sermons as preacher emeritus in some of the most famous mosques in major population centers, while continuing to deliver his message in the form of popular conferences, not only in Turkey, but also in Western Europe. In his speeches and writings Gülen envisions a twenty first century in which we shall witness the birth of a spiritual dynamic that will revitalize long-dormant moral values; an age of tolerance, understanding, and international cooperation that will ultimately lead, through inter-cultural dialogue and a sharing of values, to a single, inclusive civilization. In the field of education, he has spearheaded the establishment of many charitable organizations to work for the welfare of the community, both within and without Turkey. He has inspired the use of mass media, notably television, to inform the public, of matters of pressing concern to them, individually and collectively. Gülen believes the road to justice for all is dependent on the provision of an adequate and appropriate universal education. Only then will there be sufficient understanding and tolerance to secure respect for the rights of others. To this end, he has, over the years, encouraged the social elite and community leaders, powerful industrialists as well as small businessmen, to support quality education. With donations from these sources, educational trusts have been able to establish many schools, both in Turkey and abroad. Gülen has stated that in the modern world the only way to get others to accept your ideas is by persuasion. He describes those who resort to force as being intellectually bankrupt; people will always demand freedom of choice in the way they run their affairs and in their expression of their spiritual and religious values. Democracy, Gülen argues, in spite of its many shortcomings, is now the only viable political system, and people should strive to modernize and consolidate democratic institutions in order to build a society where individual rights and freedoms are respected and protected, where equal opportunity for all is more than a dream. Since his retirement, Gülen has concentrated his efforts on establishing a dialogue among the factions representing different ideologies, cultures, religions and nations. In 1999, his paper "The Necessity of Interfaith Dialogue" was presented to the Parliament of World's Religions in Cape Town, December 1-8. He maintains that "dialogue is a must" and that people, regardless of nation or political borders, have far more in common than they realize. Given all of this, Gülen considers it both worthwhile and necessary for a sincere dialogue to be established in order to increase mutual understanding. To this end, he has helped to establish the Journalists and Writers Foundation (1994), whose activities to promote dialogue and tolerance among all strata of the society have been warmly welcomed by people from almost all walks of life. Again to this end, Gulen visits and receives leading figures, not only from among the Turkish population, but from all over the world. Pope John Paul II at the Vatican, the late John O'Connor, Archbishop of New York, Leon Levy, former president of The Anti-Defamation League are among many leading representatives of world religions with whom Gülen has met to discuss dialogue and take initiatives in this respect. In Turkey, the Vatican's Ambassador to Turkey, the Patriarch of the Turkish Orthodox Church, the Patriarch of the Turkish Armenian community, the Chief Rabbi of the Turkish Jewish community and many other leading figures in Turkey have frequently met with him, portraying an example of how sincere dialogue can be established between people of faith. In his meeting with Pope John Paul II at the Vatican (1998), Gillen presented a proposal to take firm steps to stop the conflict in the Middle East via collaborative work on this soil, a place where all three religions originated. In his proposal, he also underlined the fact that science and religion are in fact two different aspects that emanate from the same truth: "Humankind from time to time has denied religion in the name of science and denied science in the name of religion, arguing that the two present conflicting views. All knowledge belongs to God and religion is from God. How then can the two be in conflict? To this end, our joint efforts directed at inter-religious dialogue can do much to improve understanding and tolerance among people." Gülen released a press declaration renouncing the September 11th terrorist attacks on the USA, which he regarded as a great blow to world peace that unfairly tarnished the credit of believers: "... terror can never be used in the name of Islam or for the sake of any Islamic ends. A terrorist cannot be a Muslim and a Muslim cannot be a terrorist. A Muslim can only be the representative and symbol of peace, welfare, and prosperity:"
Gülen's efforts for worldwide peace have been echoed at conferences and symposiums. "The Peaceful Heroes Symposium" (April 11-13, 2003) at the University of Texas, Austin, produced a list of peacemakers over 5,000 years of human history. Gülen was mentioned among contemporary heroes of peace, in a list which includes names such as Jesus, Buddha, Mohandas Gandhi, Martin Luther King, Jr., and Mother Teresa. 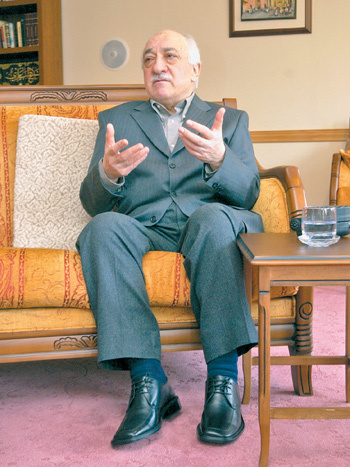 Gülen contributes to a number of journals and magazines. He writes the editorial page for several magazines. He writes the lead article for The Fountain, Yeni Omit, Sızıntı, and Yagmur, leading popular and spiritual thought magazines in Turkey. He has written more than forty books, hundreds of articles, and recorded thousands of audio and videocassettes. He has delivered innumerable speeches on many social and religious issues. Some of his books-many of which have been bestsellers in Turkey -have been made available in English translations, such as, Prophet Muhammad: Aspects of His Life, Questions and Answers about Faith, Pearls of Wisdom, Prophet Muhammad as Commander, Essentials of the Islamic Faith, Towards the Lost Paradise, Key Concepts in the Practice of Sufism. A number have also been translated into German, Russian, Albanian, Japanese, Indonesian, and Spanish. The educational trusts inspired by Gillen have established countless non-profit voluntary organizations, foundations and associations in Turkey and abroad which support many scholarships. Though a well-known public figure, Gülen has always shied away from involvement in formal politics. Gülen's admirers include leading journalists, academics, TV personalities, politicians, and Turkish and foreign state authorities. They see in him a true innovator and unique social reformer who practices what he preaches. They see him as a peace activist, an intellectual, a religious scholar, a mentor, author and poet, a great thinker and spiritual guide who has devoted his life to seeking the solutions for society's ills and spiritual needs. They see the movement he helped to nurture as a movement dedicated to education, but an education of the heart and soul as well as of the mind, aimed at reviving and invigorating the whole being to achieve competence and providing goods and services useful to others. Source: M. Fethullah Gulen: Essays Perspectives Opinions, Fountain, 2002. page: 3-9.